Tonight I went out to dinner with a few friends and when we left the restaurant the streets were covered with fresh snow. We're supposed to get quite a storm tonight and tomorrow. It's cozy inside and now all I want is some hot tea and some cuddling on the couch with Jamie. 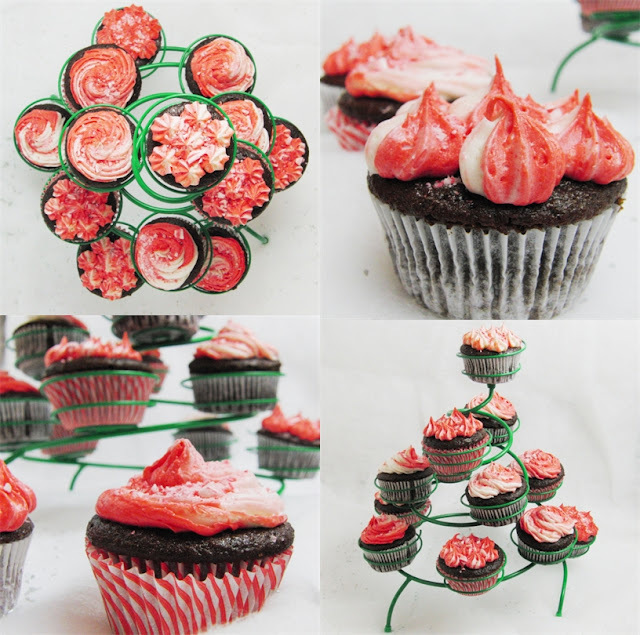 It's also the season for parties with friends and get-togethers at work, and there's nothing like a tray of beautiful cupcakes to bring a smile to someone's face, like these Chocolate Peppermint Swirl Cupcakes. 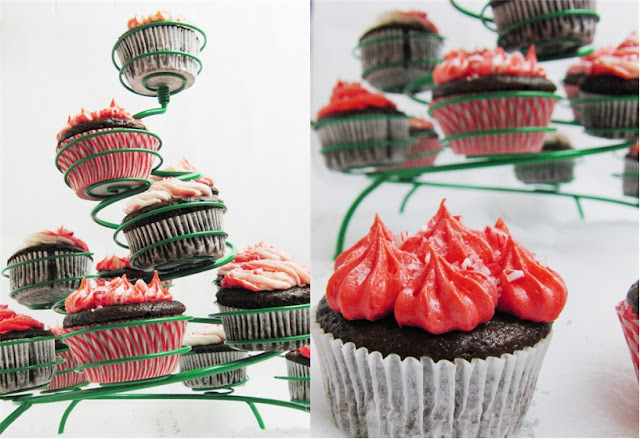 Especially when the cupcake is dark and moist and chocolatey, and the buttercream is fluffy and sweet with just the right amount of peppermint flavor. With pretty swirls of dark pink and white frosting (because I just couldn't get it as red as I intended) and a sprinkling of crushed peppermint. There comes a time when bakers discover a recipe that just makes all others seem... inadequate and boring. And I think I've achieved that with this chocolate cupcake. I adapted it from a chocolate cake recipe my mom has been using for years, a recipe that calls for boiling water in the batter, which makes the cake amazingly moist. I really didn't want to have such thin batter, though, when making cupcakes, so I eliminated the water and replaced it with a mixture of sour cream and Greek yogurt, which makes all baked goods better. I had to make the recipe twice, because the first time I filled them too full, not realizing just how much they would rise, and they overflowed into great big muffin tops which were not at all what I was going for (and you might have already guessed that those cake crumbs from the first batch will be made into truffles for Christmas...). So, for the next round, I filled 30 cups instead of 24 and decreased the baking soda a touch. I couldn't have been happier with the result, and my coworkers have been raving for two days about how good they are. And if you don't like to clean up (is there anyone who does?) you'll be happy to know that the cake is easily mixed up in just one bowl. Let the dairy products for the cake (eggs, milk and sour cream/yogurt) sit out at room temperature for about an hour before mixing up your cake (ingredients that are room temperature instead of cold from the fridge work better in cakes). Preheat the oven to 350 F. Place 30 cupcake liners in baking pans. In the bowl of your electric mixer, combine the flour, sugar, cocoa, espresso powder, baking soda, baking powder and salt. Add the eggs, milk, sour cream, oil and vanilla. Beat on low speed for 30 seconds to combine, then on medium speed for 2 minutes until well blended. Divide the batter between the liners. 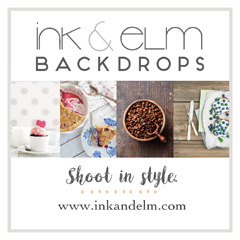 (The cups should be no more than 2/3 full (or even a little less) - don't be tempted to fill them too full by making 24 cupcakes instead of 30 - these cupcakes rise quite a bit and you don't want the tops to overflow or you will have great big muffin tops on your cupcakes. Bake at 350 for 18-22 minutes (rotating the pans halfway through) until the center of the cake is done. Cool in the pans on wire racks for 5 minutes, then remove the cupcakes from the pans, place on wire racks, and cover with clean kitchen towels to cool completely before frosting. With an electric mixer, mix the cream cheese and butter on low speed until smooth and combined Add the peppermint extract and 1 cup of powdered sugar and beat until smooth. Add the remaining powdered sugar, 1 cup at a time, until combined. Add the milk, a little at a time, and whip for 3-4 minutes until light and fluffy. Scoop half the frosting into a separate bowl and cover with plastic. Add red gel food coloring to the other half of the frosting (the gel kind will not dilute your frosting like the liquid food coloring will), until the frosting has reached the color you want. Spoon the white and red frosting into a piping bag or tool, alternating the colors, so that when you pipe the frosting, the colors will be swirled together. With your electric mixer, beat the butter and 1 cup sugar on medium speed until light and fluffy, about 5 minutes. Beat in the egg and vanilla until well combined. In a separate bowl, combine the flour, cocoa, baking soda, baking powder and salt. Add the flour mixture by spoonfuls to the batter, mixing just until combined. If the dough seems too dry, add 1-2 tablespoons milk or coffee to bring the dough together. Roll the cookie dough into 1 1/2 inch balls (about 36 balls) and roll each cookie ball in the 1/4 cup sugar. Using the back of a 1-teaspoon measuring spoon, press an indentation in the center of each cookie. Place cookie balls on a baking sheet and freeze until firm, about an hour. Preheat the oven to 350 F. In a small saucepan, combine the chocolate chips and sweetened condensed milk; warm over medium-low heat until the chocolate is melted, stirring mixture occasionally until smooth. Stir in 4 tablespoons cherry juice. Bake cookies for 7 minutes. Remove from oven, cool for 1 minute on the baking sheet, then transfer to a wire rack to cool completely. If you have any frosting left after baking all the cookies, you can drizzle this over the cookies and add some decorative sprinkles (although the frosting will take much longer to set this way, whereas it comes out of the oven perfectly set). 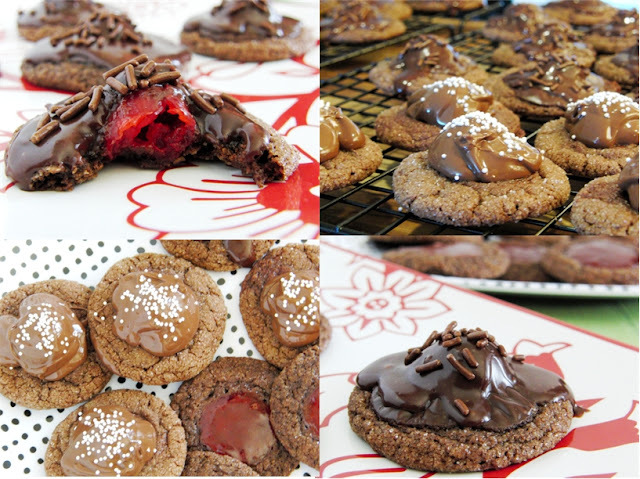 Alternatively, you can fill the cookies with jam, or top the cherries with a small dab of Nutella. Here's our Christmas menu, and I'm very excited to make prime rib for the first time!